[ARTICLES OF CONFEDERATION]. Newspaper. 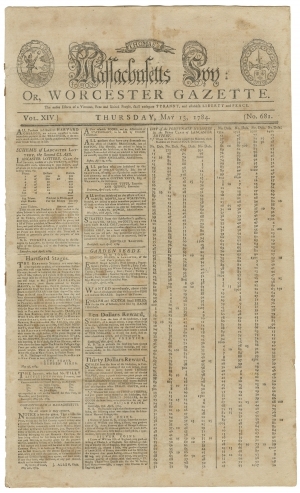 Thomas’s Massachusetts Spy, Or, The Worcester Gazette, Worcester, Mass., May 13, 1784. 4 pp., 11 x 18½ in. With a “Liberty Defended from Tyranny” masthead designed by Paul Revere, page 1 features advertisements, legal notices (the first of which is Harvard College requesting immediate payment of debts, “as money is much wanted,” as well as stage coach schedules and a lengthy list of winning lottery numbers. Page 2 features a lengthy letter on taxes, lands, and the public debt “The people are seldom wrong when they are rightly informed, and fully comprehend the whole system offered to their contemplation: But they are too frequently deceived by wicked and designing men, or led a fruitless round by the low ambition of a few, who court their favor by means disgraceful to honesty. Hence arises the many county Conventions, to complain of those grievances which are inseparable from an expensive war; and which all the nations of the earth have experienced in a much greater degree than we do; and which nothing but industry and frugality, joined to a proper subordination to the laws of a free and equal government, can redress. Also, observations of a hydrogen-filled balloon flight in Oxford, England, as well as a report of the acts of the Portsmouth, New Hampshire General Assembly, including protection of anadromous fishes such as shad and salmon, as well as an act allowing John Paul Jones to proceed with a lawsuit. Page 3 includes reports of the Continental Congress in Annapolis invoking Article V of the Articles of Confederation to require states to appoint legislators and set legislative terms, as well as a report of Major-General Baron von Steuben’s resignation, and “ a great majority of votes for his Excellency John Hancock, Esq., as Governour” in Massachusetts. Page 4 contains an installment of the serialized “History of America” by William Robertson, D.D.